When Canada released its Silver Incuse Maple Leaf coin in 2018, it marked the first time it had ever struck an incuse coin in the 30-year history of the Silver Maple Leaf bullion series. If there were any doubts about how collectors would respond they were soon dispelled as the entire mintage quickly sold out. Now the Silver Incuse Maple Leaf returns in 2019 with this beautiful one-ounce coin that features the same incredible purity and security collectors have come to expect from one of the world’s most popular bullion series. Struck by the prestigious Royal Canadian Mint and released on the 40th anniversary of Canada’s Gold Maple Leaf series, each $5 legal tender coin has been crafted in one full ounce of 99.99% fine silver. In addition to the traditional Sugar Maple Leaf adorning the coin’s reverse and a regal portrait of Queen Elizabeth II gracing the obverse – which are both displayed below the surface of the coin rather than above it – the coin features added security features that include radial lines in the background and a laser-engraved textured Maple Leaf mint mark with a tiny “19” visible under magnification. 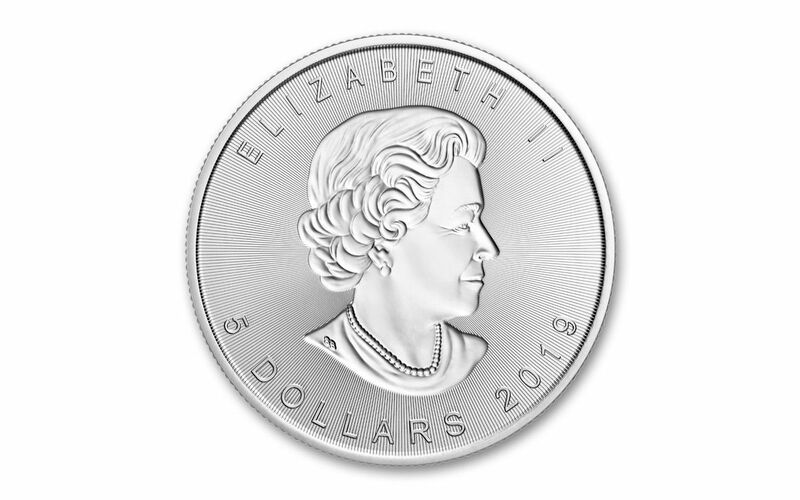 In addition, your 2019 Canada One-Ounce Silver Incuse Maple Leaf will arrive in gleaming Gem Brilliant Uncirculated (BU) condition. A Gem BU grade means that your coin is the product of a superb strike that places it firmly among the elite of the run – as fresh and crisp as the day it left the mint! With the mintage of the 2018 version entirely sold out, the time to secure one of these 2019 Silver Incuse Maple Leaf coins is now because unfortunately not everyone who would like to hold one of these beauties in their hands will get the opportunity. Just 250,000 will be struck – the same mintage as 2018 and an incredibly low number compared to the tens of millions of standard Silver Maple Leaf coins struck each year! 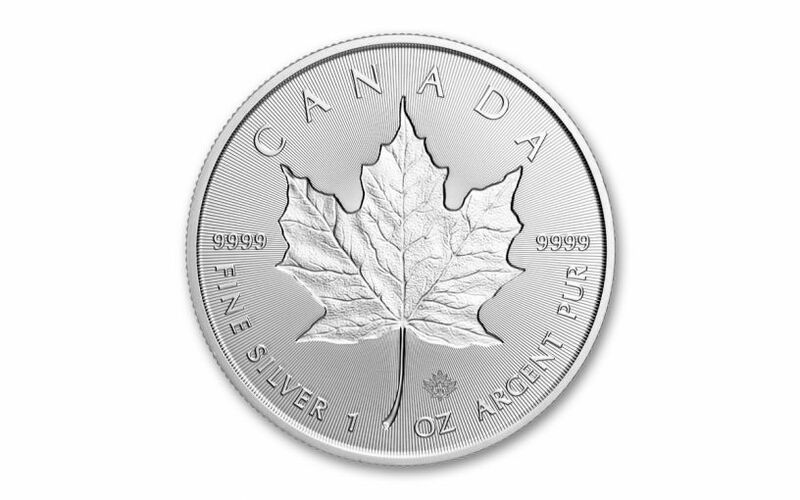 Don’t wait for this incredible opportunity to pass you by – add the 2019 Canada One-Ounce Silver Incuse Maple Leaf to your cart today! SECOND YEAR FOR SILVER INCUSE MAPLE LEAF SERIES – 2019 marks the second year that the Royal Canadian Mint has issued Silver Incuse Maple Leaf coins featuring designs displayed below the surface of the coin rather than above it. The traditional Sugar Maple Leaf adorns the coin’s reverse while a regal portrait of Queen Elizabeth II graces the obverse. STRUCK IN HIGHLY-PURE SILVER – Each Silver Incuse Maple Leaf is struck in one ounce of highly-pure 99.99% silver. CANADIAN LEGAL TENDER – These One-Ounce Silver Incuse Maple Leaf are $5 legal tender in Canada. GLEAMING BRILLIANT UNCIRCULATED CONDITION – Your 2019 Canada One-Ounce Silver Incuse Maple Leaf comes in gleaming Gem Brilliant Uncirculated (BU) condition, meaning that your coin is the product of a superb strike that places it firmly among the elite of the run. ADVANCED SECURITY FEATURES – An added feature of the One-Ounce Silver Incuse Maple Leaf is its added security features that include radial lines in the background and a laser-engraved textured Maple Leaf mint mark with a tiny “19” visible under magnification. LIMITED EDITION – The Royal Canadian Mint has set the worldwide limited edition for these coins at 250,000 – the same mintage as the 2018 release that has been announced as a complete sell-out at the Mint. The 2018 edition quickly sold out so don’t delay securing the new 2019 Canada Silver Incuse Maple Leaf. Order yours now!